There are 4 distinct Phases of EBSM, which define the journey towards Excellence in library collection performance. Assessment Gaining an understanding of the current collection performance position, and setting up the initial EBSM configuration specific to the library. At this stage, Calculated performance figures will almost certainly be significantly short of targets – this will simply reflect the reality that a framework for continuous collection performance improvement has not been established previously. Acclimitisation Getting to know EBSM better - fine tuning targets and processes to meet the library's needs. Performance improvements may stutter due to the changing targets as the library gains better insight into the targets that are achievable and realistic across its many collections. 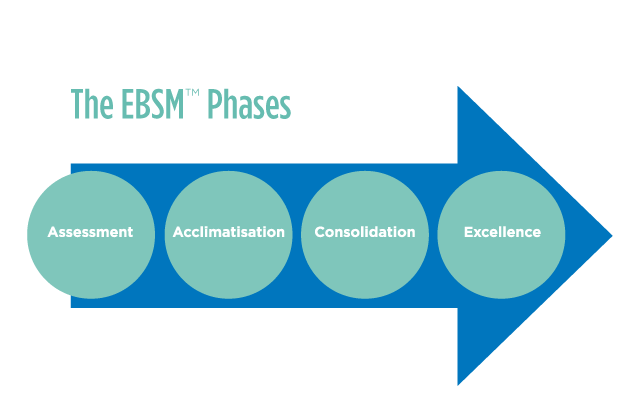 Consolidation The longest EBSM Phase - running with the methodology on a collection by collection basis and improving towards targets. As EBSM becomes ingrained in the library’s workflow, steady progress towards targets should resume. Excellence Recognizing that good performance isn't enough, and striving for improvement towards stretch targets. As libraries progress through the phases, performance measurements are recorded against each of the EBSM KPIs at monthly intervals – helping to monitor the impact of using EBSM on collection performance. Comparing these performance measurements with targets help to determine the appropriate action to take which are supported by collectionHQ’s Action Plans. Throughout the journey towards Excellence, the progress towards a Library’s performance targets will generally be regular and measurable – though not always steady.